Sauron gave to the Kings of the seven houses of Dwarves rings of power – metal bands set with a single gem; but despite his plans, these rings were unable to dominate the Dwarves, neither by lengthening the span of their lives nor making them evil. The bearers did, however, lust after gold and other precious materials. His failure caused Sauron to dislike the Dwarves even more, and he set out to recover the Seven. He was successful in the recovery of three; the other four had been consumed by dragons. 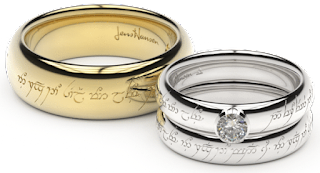 The last of the Rings he was able to recover was the one which had originally been given to Durin III of Moria by the Elven-smiths (which was probably the most powerful of the Seven); long kept hidden, it was taken from Thráin II, Durin’s Heir, during his imprisonment in Dol Guldur.